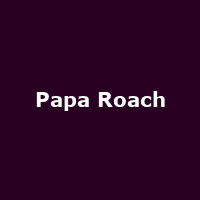 Papa Roach are a California-based alternative/ nu metal band formed in 1993. Current lineup features Jacoby Shaddix - Vocals, Jerry Horton - Guitar, Tobin Esperance - Bass and Tony Palermo - Drums. They released their debut album, "Old Friends From Young Years" in 1997, followed by: "Infest" (2000), "Lovehatetragedy" (2002), "Getting Away with Murder" (2004), "The Paramour Sessions" (2006), "Metamorphosis" (2009), "The Connection" (2012), "F.E.A.R." (2015), "Crooked Teeth" (2017), plus 2019's: "Who Do You Trust? ".